Jack Crawford: What do you want me to do? Will Graham: Dust Mrs. Leeds' finger and toenails, and the corneas of all their eyes. I think he took off his gloves, Jack. Sir Anthony Hopkins may have taken the role of Hannibal Lecter and made it his own in a trilogy of successful (though progressively less satisfying) films based on creepy Thomas Harris novels (The Silence of The Lambs, Hannibal, Red Dragon), but as you likely know by now (unless you have been under a rock), there was in fact an earlier, however brief, incarnation of the brain-eating psychopath, played with an equal dose of controlled finesse and tempered rage by Brian Cox, in Michael "Miami Vice" Mann's 1986 thriller, Manhunter. Sure, for some reason or another Lecter's name was changed in Manhunter to Lecktor (sounds more like a character from Superman), but he's the same brilliant, caged killing machine, no matter how you spell it. Despite the absolutely horrible name of the film (the title sounds like a low-rent video game), Manhunter is in fact Mann's dark, riveting version of Harris' Red Dragon novel, and follows the procedural exploits of FBI agent/profiler Will Graham (William Petersen), the man responsible for capturing Dr. Lecktor (Cox), as Graham tries to bring down a serial killer dubbed The Tooth Fairy (the completely disturbing Tom Noonan) before he can strike again. This single-disc release of Manhunter from Anchor Bay, part of their DiViMax series that promises "state of the art picture quality," is the third DVD iteration of Mann's film, coming not too long after a nicely packaged two-disc limited edition that contained two different cuts, in addition to a nice stack of extras. This time around the DiViMax moniker showcases what is billed as the "restored director's cut," or the "preferred director's cut" as Mann himself calls it on the included commentary track, and while it runs only a few minutes longer than previous versions, it is a decidedly better-looking print, and is the cleanest rendition of Mann's original vision that we have had the opportunity to see. The added footage, some of which are just expanded versions of existing scenes, on their own don't necessarily make this a better film (I always thought it was a piece of particularly solid and exciting entertainment) but one or two moments (such as a closing sequence that brings more substantive closure to Graham's character) do stand out as worthy additions to the overall story. The bulk of the story is about Graham, and how the methodical, analytical hunt for The Tooth Fairy has drawn him back into profiling, and how it requires him to solicit help from his imprisoned nemesis Dr. Lektor, but it is really Noonan's homicidal Francis Dollarhyde that resonates throughout the film, more so than Cox's less-refined but equally evil Lektor, and today holds up as one of filmdom's spookier villains; a towering giant of a man with a soft-spoken voice and a burning inner need to turn an innocent family home into a charnel house and nosy reporters into flaming steaks on wheels. Though the character doesn't really get any major screen time until about an hour in, Mann then deftly shifts the story away from Graham and over to Dollarhyde, even to the point of presenting the killer's weirdly cockeyed stab at wooing a blind co-worker (Joan Allen), which includes a beautiful sequence involving a sedated tiger; it is a gently rhythmic scene layered with oodles of underlying and bundled-up sexual repression. While the subject of FBI profilers has become almost second-nature on television and in films, in 1986 it was fairly virginal territory, and in bringing Harris' story to the screen Mann was pretty much at the forefront of ushering in an era of brooding, pensive agents who allowed themselves to get inside the head of their deadly quarry, or "get the scent," as Lektor taunts Graham at one point. True to what would become genre staples, Manhunter is filled with tense, harried sequences centered around various lab results, handwriting analysis, and driver's license cross-checking, and true to his Miami Vice roots, Mann has sprinkled Manhunter with a number of well-placed rock/pop songs (some of which unfortunately date the film horribly). This is not a shoot-out/car chase cops-and-killers story (though there is a bit of the latter during the big In-A-Gadda-Da-Vida-laced climax), but is instead a more cerebral thriller, using Petersen's patented steely-eyed stare and constantly furrowed brow to portray a man desperately trying to channel the vibe of a killer. Image Transfer Review: Like the earlier LE, this version is also presented in 2.35:1 anamorphic widescreen, though oddly enough not THX certified this time around on this new transfer. Anchor Bay has included a disclaimer at the start of the disc, announcing that they know the quality of "new" scenes is not on par with the rest of the transfer, but to be quite honest there was not that huge of a disparity in the image quality on the brief, newly added stuff versus the so-called "regular" footage. The added scenes, which don't total more than a few minutes altogether, do have some slightly more pronounced haloing, and perhaps the colors are not as sharp, but they are not nearly as distracting or obvious as the disclaimer prepared me for. With that said, the overall image quality for this new transfer is surprisingly quite good, to say nothing of being a dramatic improvement over earlier incarnations. Colors are noticeably more bold and natural than on the LE, and depth of the black levels is substantially improved. There are still the odd moments of very fine grain and an occasional speck or two, but these are tolerable. To put it simply, this DiViMax release is a definite step up from the LE in terms of image quality. 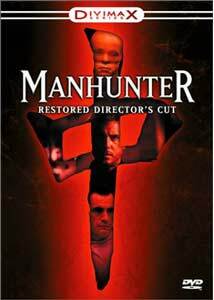 Audio Transfer Review: I'm curious, and more than a little disappointed, that Anchor Bay didn't port over the 5.1 remix found on the two-disc LE of Manhunter for this release. All that's included here is a fairly lifeless 2.0 surround track that is mediocre at best, though to be fair it is perfectly functional, but I would have loved to have seen this expanded cut of the film get wrapped in a 5.1 remix, as well. Still, it's not awful, just not great. As with many films from the mid-1980s, voices tend to sound noticeably flat, and there's really not much in the way of rear channel activity at all. Overall fidelity is not especially crisp, though Mann's dominant use of rock music still works rather effectively, given the limited range of the mix. Extras Review: None of the goodies found on the two-disc limited edition made their way onto this new issue, but Anchor Bay did come through with a decent replacement. Writer/director Michael Mann provides a full-length, scene-specific commentary track on this, the third DVD edition of Manhunter, which he refers to as the "director preferred" cut of the film. Even with a fair amount of silent gaps and a rather monotone delivery, Mann still presents an informative collection of material, expanding on character backstories and discussing the resistance he was up against to use more Hannibal Lector (or Lecktor as he is billed here). In the hip trivia department, he drops the tidbit that Brian Dennehy was originally up for the part of Lector/Lecktor, but that he persuaded Mann to check out Brian Cox, who eventually got the role. It's not most riveting delivery, but Mann reveals quite a bit of worthy content, including pointing out the subtle use of "acute angles" when shooting Dollarhyde. There are a wealth of interesting photos in the Still Galleries section, where it is divided into Production Stills (approximately 87 images), Deleted and Alternate Scenes (44 images), and Posters & Advertising (80 images). The Production Stills are almost like watching the film all over again, as they are sequential and cover just about all of the pivotal sequences. The Deleted images, including some great shots of Dollarhyde with the full Red Dragon tattoo are really creepy, while the Posters section just shows me how poorly Manhunter was marketed; these are some of the absolute worst movie posters I have ever seen. Pop the disc into your DVD-ROM drive, and you will be treated to the 133-page screenplay in PDF format, here still titled Red Dragon. The disc is cut into 30 chapters, and does not feature any subtitles. If you already have the limited edition release, you may want to rent this first, at the very least, for the Michael Mann commentary, and then to see if the image transfer improvements are enough to merit purchasing the film yet again. As for the rest of you, you really can't go wrong with a film like Manhunter, it is exciting, cerebral and properly scary. This DiViMax edition, while not as loaded as the somewhat increasingly more difficult-to-locate LE, makes for an easy decision, especially with the inclusion of the aforementioned Mann commentary. Plus, it's fun to compare Brian Cox and Anthony Hopkins portrayal of everyone's favorite cannibal.